Cuban bread first became popular in America in Tampa, Florida, during the 1800s. The bread is similar to French or Italian bread. Depending on the recipe, taste and consistency will slightly vary. It is a wonderful bread to make Pan Cubano. This sandwich is stacked with cooked ham, roasted pork, cheese and pickles. It is served either hot like a Panini or room temperature. Fresh Cuban bread will be ready in 2 hours. Check the manufacturer's instruction manual for ingredient order specific to your machine. Each brand can be different. Order of ingredients does matter. For Panasonic, National, DAK and Welbilt machines, put dry ingredients in the bread pan first. For Black & Decker, Breadman, Large Oster, West Bend and Large Zojirushi, place wet ingredients first. This particular recipe is intended for a large Zojirushi bread machine. It makes a 1 1/2-lb. loaf of bread. Gather the necessary ingredients. For best results, measure ingredients meticulously. Begin by pouring 1 1/3 cup of water into the bread pan. Next, sweeten with 1 1/2-tsp. sugar. Put in 1 tbsp. salt. Evenly pour 3 cups of bread flour. Level the bread flour with the straight edge of a knife each time for accuracy. Make a small well in the top of the bread flour. Sprinkle 2 1/2 tsp. yeast into it. Place bread pan into the machine. Program the machine for "French" or "Basic Cycle" if you want the machine to bake the bread as well as knead and rise. Press "On" or "Start." For a more authentic baguette, bake the Cuban bread outside the machine. Set the machine cycle to "Dough" or "Manual." Rising time is complete when the machine beeps. In 2 hours, you will have freshly baked Cuban bread. Ready time for dough is approximately 45 minutes. Check dough consistency during the first 5 to 10 minutes of the kneading cycle. If ingredients are dry or not easily forming into a smooth, formed ball, add an additional 1/2 tsp. of water at the time until the dough kneads into a ball. If the dough appears too wet or sticking at the sides and bottom, add 1/2 tsp. of bread flour at a time. Bake the Cuban bread outside the machine if you prefer a more authentic baguette. For the more-serious bread baker, set the bread machine cycle to "Dough" or "Manual." When rising time is complete, the machine will beep. Preheat the oven temperature to 375-degrees Fahrenheit for oven-baked bread. Grease a baguette pan's bottom and sides. Carefully remove the dough from the bread pan. Shape it into a baguette, approximately 12 inches. Place doughy baguette into the prepared baguette pan. Bread will continue to rise as it heats in the oven. Total bake time if baked in the oven is 35 to 40 minutes. Remove baguette pan with oven mitts when complete. Test for doneness. The top crust of the Cuban bread will be thin and slightly browned. The inside will have a soft, fluffy consistency. Lightly tap on the bread on its underside. It should sound hollow. Place on a wire cooling rack for 10 to 15 minutes before slicing. Using oven mitts, remove bread pan from the machine. Take baked Cuban bread out of the pan by gently tipping it over a wire cooling rack. Keep oven mitts on. Take out the kneading blades from the bottom of the bread. Set loaf upright on a wire rack to cool to room temperature. Let bread cool completely before slicing. 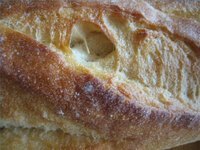 Check out fooddownunder.com if you need to increase or decrease the Cuban bread machine recipe (see link in Resources). This site has a yield calculator that allows you to adjust ingredients accurately. Use bread flour for best results. Check manufacturer manual for ingredient order. Look at online sites such as bread-machine-recipes.com which offers whole-wheat Cuban bread for other Cuban bread recipes. Pick up a copy of "The Bread Lover's Bread Machine Cookbook" by Beth Hensperger for Cuban bread and other bread machine recipes. Always wear oven mitts before removing bread pan out of bread machine or oven. Wait 10 to 15 minutes before slicing. If still too warm, bread will be difficult to slice and could possibly collapse.